D etermining which competitions and leaderboards to run can be a daunting task. There are so many options, thanks to all of the data you’re able to track in your CRM. So where do you start? It’s challenging for salespeople to know which direction to steer the customer conversation when they don’t which competitors they’re up against. Ensure that’s not the case on your team, by keeping them focused on uncovering the competitors in their opportunities. Herff Jones did just that, running a two-week competition around having reps identify the competitors on opportunities and log that information in Salesforce, their CRM. They saw a 6,000% increase (yes, you read that correctly) in the activity as a result. And the prize? A $25 Amazon gift card! How will reps know where to focus if they are chasing opportunities that will never happen? They won’t. We’ve shared ideas on motivating the behaviors that lead to sales, but now it’s time to talk about that win. Varsity Spirit used two motivation campaigns for this one. First, they ran a contest early in their customer buying cycle around appointments set, to get reps focused on capturing as many opportunities as possible. They saw a huge spike in appointments set – a 137% increase! Then, to get reps focused on closing as many of those new sales opportunities as possible, they ran a three-week contest where every time a rep closed a sale that rep received 15 points. The result was $1.6 million in incremental revenue. It’s worth noting that each of the companies in these examples relied on more than sales contests alone – that was only part of the campaign. Components like recognition, collaboration and real-time leaderboards worked alongside competition, surrounding the reps involved with motivation, to keep them rallied, focused and closing deals. 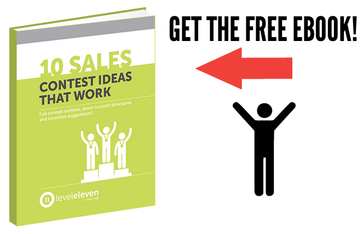 Get 4 sales contest ideas, and find out what happened when other companies implemented them, too.